In JADE's 1st ed AD&D Campaign Hymns of a Vagabond, the party is wintering at a small stone fort called Waerham's Hold. 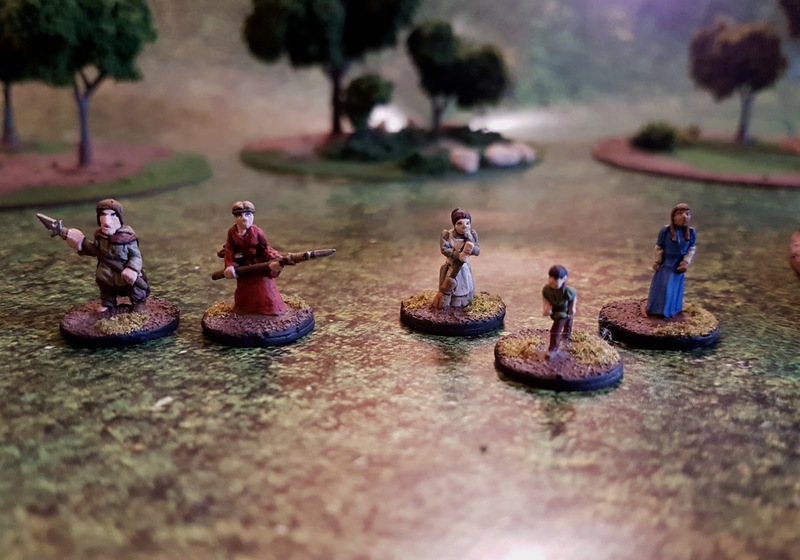 Through their journey's they have battled many goblins and managed to save this group of five peasants, who live and work in the Hold with them. This group of peasants has become collectively known as the Tarleys. This all started when two farmers (and their grandpa but he is immobile so doesn't need a mini) joined us up at the Hold after we liberated it from the goblins. Scared their farm would get raided we agreed to take them in exchange for labour around the Hold. Their family name was Tarley, and so we just started refering to them as "The Tarleys". Later, when Sen and Aren met the Thief Cutter he was with three other peasants: two women and an 11 year old boy. Not knowing what else to do with them, Sen decided to bring them back to the Hold. And now, despite there now being more people who do not share the surname Tarley, the nickname "Tarleys" as a way to refer to all the peasants has stuck around. I hope that if we are actually able to recover this Hold that it becomes the local word for those of the peasant class. The Original Tarleys: John and his sister Isabel. We taught them to sue spears. In game terms these characters act more like Hirelings than full fledged NPCs. They have skills and abilities but do not level, and can only be taught a few additional skills on top of what they know. Right now we have them preparing the Hold against a Goblin Attack. This is being directed by Jocelyn, and frankly we couldn't have done it without them. They are also being trained in the use of weapons (because they will have to defend themselves against the goblins sooner or later) and take shifts watching the area from the Hold's Tower. 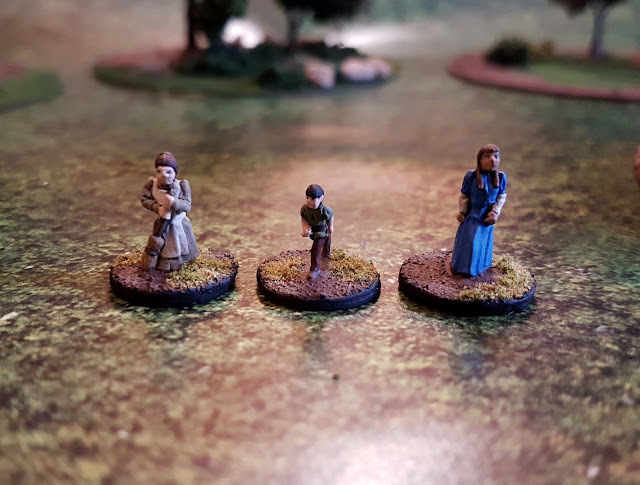 These minis mostly come from Splintered Light Miniatures, though John Tarley's figure comes from Essex Miniatures. 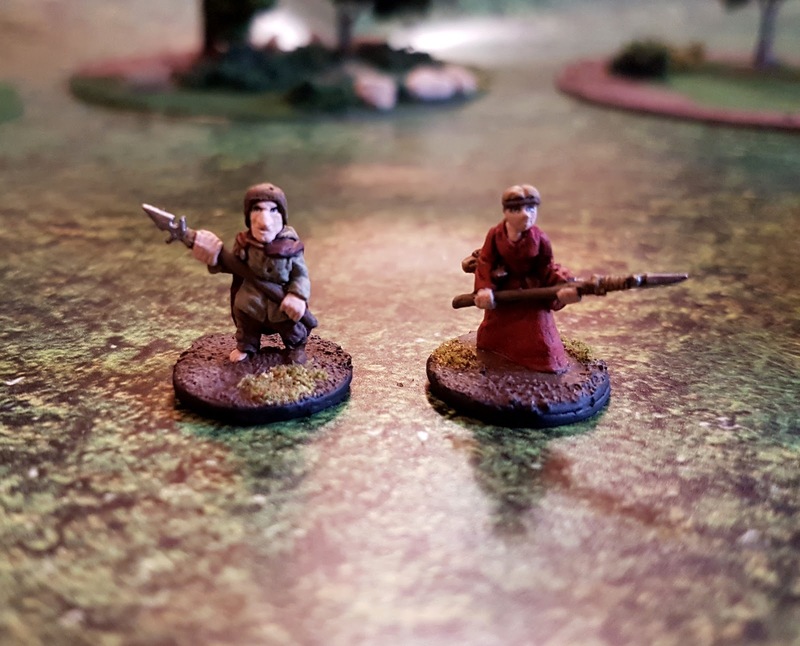 There is no photo of him on the site, but I believe he is from one of their 15mm peasant packs.